Whilst the Kingdom of Denmark has neither the wealth nor the power to defeat the great naval fleets that take pride of place in the militaries of the other Great Powers, the nation has nonetheless managed to defend its shores in spite of its tenuous position, sandwiched between the Russian Baltic Fleet and the seemingly invincible Britannian Navy. In no small way this safety is the result of the Danish navy’s on-going efforts to deny access to its native waters. This has not been achieved by investment in great fleets of Dreadnoughts or battleships, but in a far more modest weapon – the naval mine. A simple, metal shell, holding upwards of a ton of Sturginium-enriched dynamite. It is a simple danger to even the mightiest of vessel. This weapon is put to sea by Denmark’s little saviour, the Korsor Class Minelayer. Although only a small ship, comparable to the Frigates of other nations, it has proved an invaluable war machine since the outbreak of the war. Armed with an automated mine laying rig, these ships manoeuvre in large numbers, denying entire swathes of the battlefield to the enemy, forcing them towards bottlenecks where the Allied-Danish fleet can fight them on an equal footing. Although specialist in its role, it also pulls its weight as a combat vessel in its own right. By virtue of its design and powerful engines, the Korsor can make a great turn of speed. This, combined with its single powerful 10” deck gun, make it a aggressive raider in the tight confines of the Baltic Sea. My inbox was blessed with this information today! The Bourgeois masses of the Tsar come forth! “These models will be shipping from August 29th 2012. From today, you can place your advance orders in our Online Store to ensure you do not miss out on these exciting new models. One of the most exciting aspects of fielding the Russian Coalition is the multitude of eccentric tactics that you can employ. One of the most fascinating weapons at your disposal is the Vorkuta Class Land Driller. This ironclad machine moves slowly underground, before ripping through the earth and unleashing a barrage of tenacious Medium Tanks upon your terrified foe. What about emplacements? The grandeur of the Russian Coalition and the scale of its influence is epitomised in its mighty Tower Set. Monstrous, unforgiving guns will obliterate anyone foolish enough to believe they have a chance of toppling it. Whether utilising the communications, shield or gun drop ons, this bastion of war is sure to be pivotal to the success of your campaign. The Russian Coalition also boasts a very capable naval force. The Moskva Class Dreadnought is a mammoth machine possessing almost unfathomable strength. Its strategy is simple – use its powerful, forward-facing weaponry, shrugging off what pitiful resistance its opponent can muster, to force the foe to flee before its uncompromising might. This month’s Shell Case Shorts is a little bit special because the prize is not a signed book, but a signed rule book. Those fine chaps at Spartan Games have donated a copy of Dystopian Wars signed by all the development team. With this in mind, the Shell Case Shorts is going Steampunk. 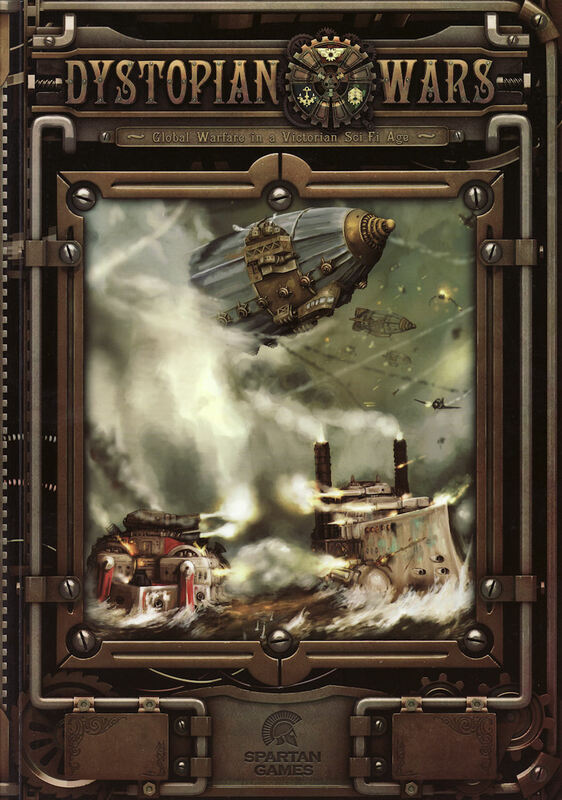 All entries should be based on a Steampunk IP such as Dystopian Wars, Wolsung, Empire of the Dead etc. And, because I’m nice, I’ll even include Warmachine in the mix. Rules are as follows….. Go here to read the rest! I will be entering. All you budding Writers should give it a go as well!